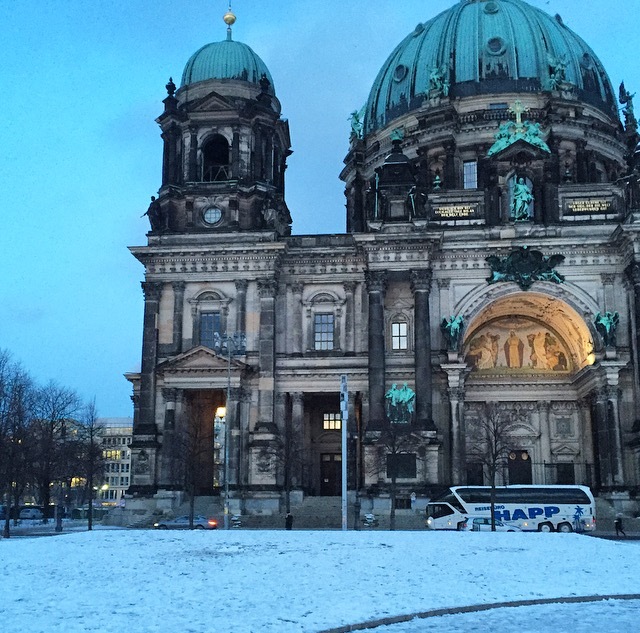 So you guys have to follow me on Instagram because I have a lot of pictures over there but today I thought I would share with you my experience in Berlin! I've never been to Germany before so when I got the opportunity to attend an event with work, well of course I was bloody excited! I actually went when Berlin Fashion Week was on but I didn't go for the shows it was an event we were hosting that coincided with BFW, but it was still pretty wonderful for me! I was only there for 2 night and flew back to Italy on the third day. Berlin is a truly unique place and I can't quite put my finger on it but there is a certain darkness about it, where you can see the beauty of some of the buildings but there is just something else there! It isn't one of those places to me that is breath taking with it's beauty, it's edgy, dark and has a vibe about it that makes it seem very different to most other cities I've visited before! Also, it's massive, like really big but the bars and coffee shops have a rawness about them that make the city seem small! I had a few meetings in different coffee shops and they were all lovely because the staff were incredibly friendly but a fight broke out in one place between 3 people which was a bit much! To get around Berlin was actually very easy, it's got a pretty well connected underground trains but even riding the underground was an experience in itself I came incredibly close to having my phones &/or my purse stolen out of my bag! I know what you're thinking I have mentioned two negatives, I must hate the place? I definitely don't, I know there are some wonderful historical attractions and I only saw a very small area of Berlin because I was there for work. It was so cold there at it was -7 at times which isn't what I am used to but they also had snow which I loved because I feel like I haven't seen snow in years, it's nice to see a real winter! The people who worked in the stores/restaurants/bars/coffee shops were incredible, the customer service was some of the best I ever had and almost everyone spoke English and if they didn't they still tried to help! I'd say Berlin is one of the places I would have loved to explore more, I would definitely visit again!